simple, macabre, what's to lose? pretty simple. If you want to ensure success, doing a chalk outline and using a template first would probably help, but I didn't and I don't mind the slight messiness of mine. To add lightness and create the illusion of depth I then used two parts water to one part bleach to go over the fronts of the ribs/etc. Lay your shirt out flat, put some magazines/newspapers inside. I like using magazines, but if you use newspaper, make sure you use at least 5-10 pages so the bleach doesn't bleed through. start painting a first coat of the entire design with four parts water to one part bleach. 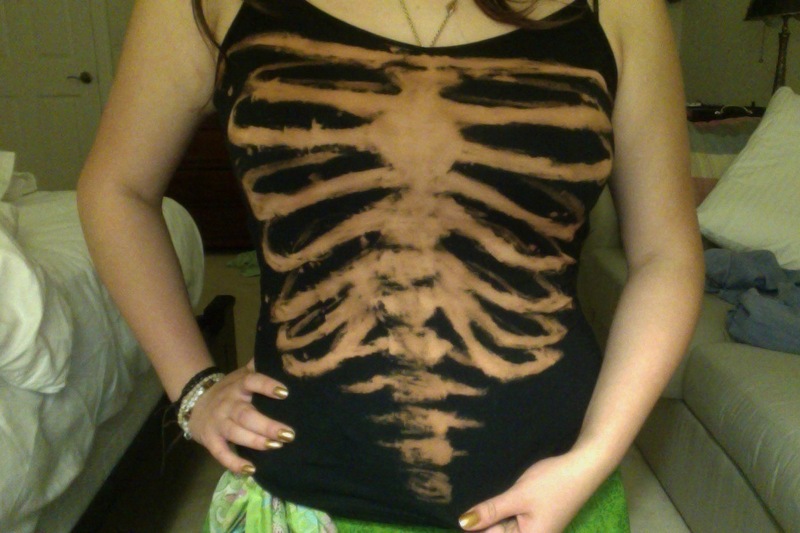 I freehanded mine, because I'm pretty partial to drawing skeletons. but I'm sure you could find a pattern online to follow if you so desire. go over the fronts of the ribs/sternum/whatever else should be in the foreground again with two parts water to one part bleach. I also added highlights to the vertebrae. Its important to let the bleach dry after this step, don't overdo it before you can tell how light its going to be. Definitely going to try this. It looks awesome! Haa... I'm aware this isn't anatomically correct. My intention was to make something I wanted to wear, not something educational. But feel free to make your own versions with as many ribs as you'd like, thanks. Besides the fact that it is extremely anatomically incorrect, it still looks super awesome! lauren- the depth is really the best part of using bleach. it really isn't hard, just layer the coats a leeeeettle bit and its fine. zombiki- post a version when youre done! I like the messiness of yours, it makes it look like an x-ray!